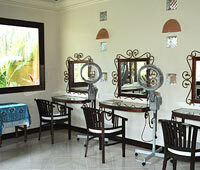 Bali Spa It’s located 15 minutes from the airport. Bel Air Spa is sanctuary; you can spend the calm slow time with beauty. 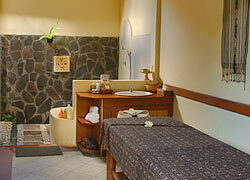 The spa offers the villa package which you can relax in the wide range of room with couples and friends. There is a pool in the garden, please spend relaxing time surrounded by beautiful and calm atmosphere. Start with Talasso Foot Bath, apply Aromatherapy Massage or Balinese Traditional Massage to release stiffness of body and Body Scrub & Pack choose from 4 kinds of scrubs. Relax in Aromatherapy Flower Bath. The last one is 30 min Facial Treatment. Plus, a light meal and tropical juice is including the course. Start with Talasso Foot Bath, apply Warm Stone Massage by using natural stone to remove deep tiredness on the body and Body Scrub & Pack choose from 4 kinds of scrubs. Relax in Aromatherapy Flower Bath. The last one is 30 min Facial Treatment. Plus, a light meal and tropical juice is including the course. 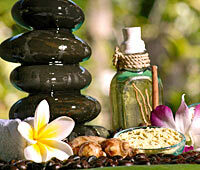 This is the exotic, luxury, and memorable program that combine variety of Aromatherapy Massage. It includes 30 min. Refresh Facial Treatment. After feeling relief by the traditional Balinese Massage, choose treatment menu from Bel Air SPA original Facial Treatment, Cream Bath, and Body Scrub. This is the whole body massage by Balinese traditional stretch and Finger Pressure Therapy to massage body and mind and relax. It improves blood circulation and muscle ache. Aroma Massage Oil adds more deep effect to the traditional therapy. This massage is utilizing that the calm rolling finger pressure, and it has effect of refreshing and relaxing from revitalizing energy balance by rolling pressure and slackness effect. Feel revitalizing mind and removing body wastes. Please choose the favorite aromatic oils from 4 kinds for the massage. This massage is Bel Air SPA original massage without using oil; the massage combines finger pressure of Thai, China and Japan, 3 kinds of massages. Massage whole body by thumbs, palms, and elbows, etc. This menu is recommended for who doesn’t like oil massage, and it’s popular for men, too. It is the healing massage used warmed natural stones. It has good effects of removing tiredness and stress by applying to Chakra of body spots and deep tiredness. Enjoy smooth massage with essential oil and stones. Stimulus concentrating massage for legs including soles’ spots. The massage removes tiredness and swelling of legs and relaxes. It’s good for taking before on boarding airplane and after walking long time. Enjoy the memorial photo with wedding costume, Balinese royal family costume! It will be memorable experience in Bali! This Traditional Facial Treatment has effect not only cleansing skin by natural products but also reducing skin horny substance and removing wastes and wrinkles. In addition, stimulate spots with appropriate face massage, and recover young smooth skin. After shampoo, massage head skin with the hair cream of recovering and protecting hair. It has effect of moisturizing and revitalizing damaged hair. Before rinse off the cream, steam hair for penetrating treatment; meanwhile, massage neck, shoulder, and arms, etc. and remove stiffness. Apply the hair tonic at the end. Shirodara is the most popular healing treatment of Ayurveda from Indian traditional medical care. Shirodara treatment is called the massage of mind, so it cares both health and beauty. Apply warmed organic sesame oil on the center of forehead, called third eye, directly. It has effects to stimulus brain and to reduce stress, sleeplessness, stiffness of neck and shoulder, headache, and wrinkles of skin. After the oil deep relaxation treatment, apply head massage. Organic sesame oil recovers moisture and brightness on head skin and hair. At the end, try Ayurvada Tea depends on guest’s Doshas. Children are welcome guests in the lobby or treatment. There is menu subject to receive 5 years and older. Warm stone massage was good. It was also good that body scrub choice available. I like the flower bath. I want to try flower bath at home!! It was great full body treatments, such as Balinese massage, shirodhara and other treatments. 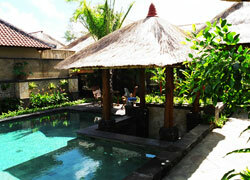 I could full enjoy Bali spa at spa villa in a tranquil environment. 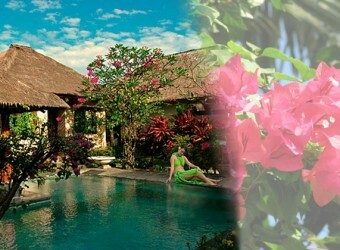 It is a spa that you can actually experience holiday in Bali.